Terry Collins' years in the game have taught him that even the greatest pitchers aren't exempt from certain truths. So the Mets' manager wasn't shocked when ace Matt Harvey didn't look as otherworldly in his second start as he had during his season debut. "I think his command was OK," Collins said Saturday night on the eve of Harvey's third start of the season. "I just don't think his stuff was plus-plus stuff like it normally is." 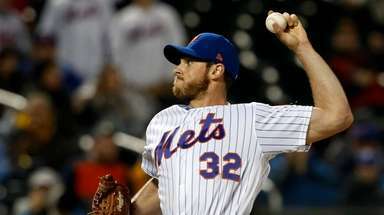 Harvey, 26, picked up the victory in the Mets' 6-5 win over the Phillies on Tuesday. 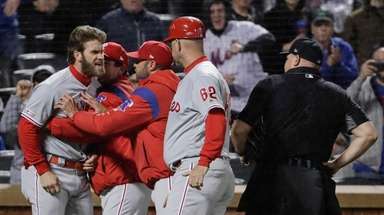 He allowed three runs and five hits in six innings and surrendered homers to Chase Utley and Cody Asche. But Harvey also flashed his trademark command in striking out eight and walking none. "His mechanics are too good," Collins said. "They're just too repeatable. I don't think command's ever going to be an issue with Matt Harvey." On Sunday, Harvey will face the Marlins, who have given him some trouble in the past. He's 0-1 with a 3.52 ERA in four career starts against Miami. Mets lefthanded reliever Alex Torres, who struck out Christian Yelich on three pitches to pick up his first major-league save Saturday night, received an updated version of the protective pitchers' caps that Major League Baseball first legalized last season. As a member of the Rays in 2013, he watched as teammate Alex Cobb was hit in the head by Eric Hosmer's line drive. Cobb was sidelined for two months. 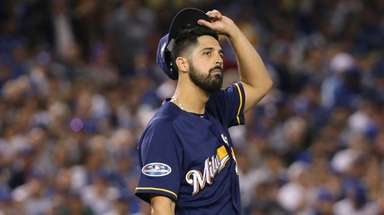 Torres began wearing the protective cap last year with the Padres, even though it was noticeably bulkier than the traditional soft cap. 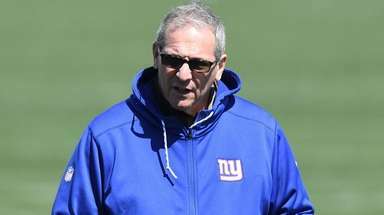 Torres had been pitching with a regular baseball cap as he waited for a revamped version of the protective cap. The new version is essentially a padded halo that fits over the typical soft cap. When asked if it is a distraction, Torres shrugged. "No," he said. "Maybe for the hitters." Collins said he wasn't surprised by how the umpires handled an awkward replay situation after Dee Gordon was awarded an infield hit with two outs in the third. Had it been ruled correctly from the start, the hit would have allowed Adeiny Hechavarria to score from second, but Gordon was called out. Though a review overturned the call, the umpires placed Hechavarria at third at their own discretion, as is dictated by rule. The replay lasted 3 minutes, 17 seconds. Hechavarria was stranded when Yelich struck out to end the inning. Collins lost a challenge in the first on Gordon's bunt single. The review lasted 2:58.